I first noticed the trend bubbling up when my interior designer, Tali Roth, sent along her styling notes for my apartment photo shoot. She had put together a deck with reference images including the floral arrangements we needed for the day. One of those images was of pampas grass. 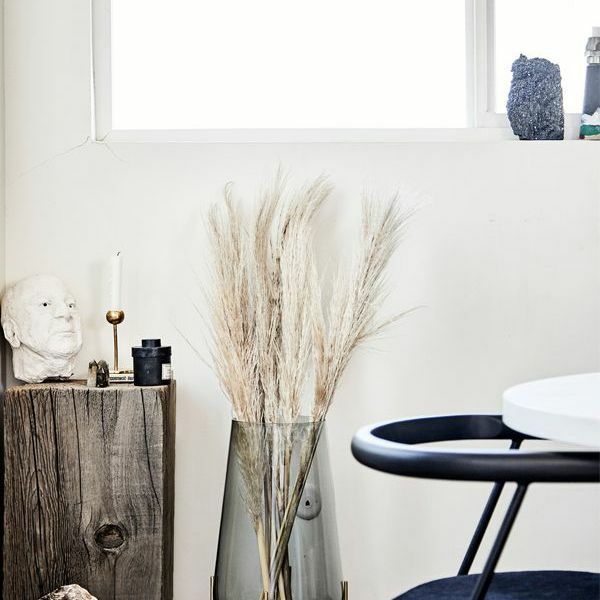 You've probably seen this wheat-like grass making appearances in the homes of some of your favorite Instagram accounts because I certainly have—we featured it in this Cali-cool home too. 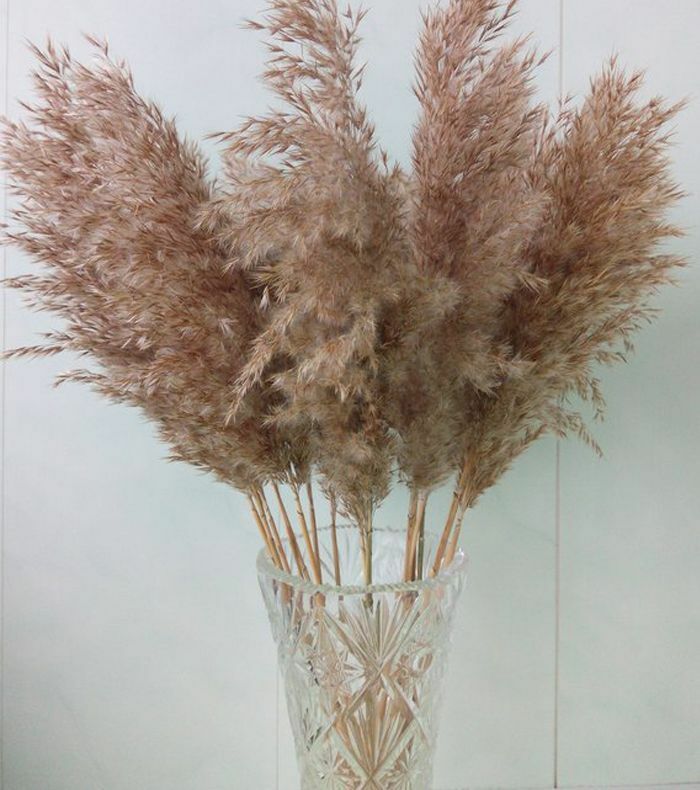 In fact, ever since I posted this image of pampas grass in my L.A.
living room, I've been flooded with inquiries asking what it is and where to get it. 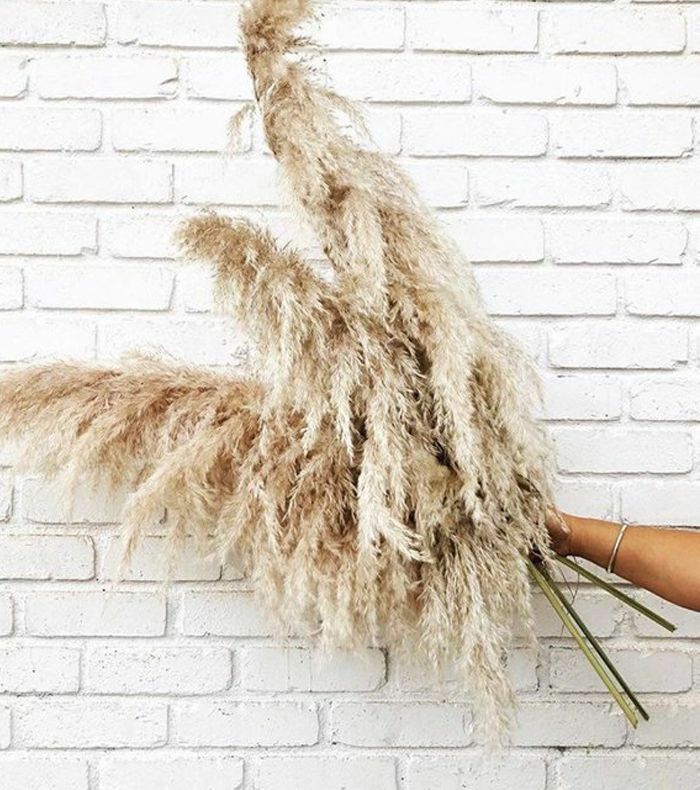 Well, we're calling it: Pampas grass is the new trendy plant that is about to blow up. The one in my living room was dried out, so I've since upgraded it with fresher and fluffier clippings. (Actually, prop stylist Cat Dash let me take some home from the Nate Berkus and Jeremiah Brent Living Spaces event; she had bought some from the L.A. flower market that morning). So what is it about this plant (which is technically an invasive garden weed that was introduced to California in 1848) that makes it so desirable? Well, the neutral colorway and textural flower really blend in with any interior design style, but it's also the evergreen nature of this plant that gives it the tick of mass appeal. It actually gets better with age, which you can't say for most plants. The only real issue that I've noticed is it's messy, so I recommend dousing it lightly with hairspray to stop it from dropping seeds everywhere. Read on to see how I've styled it in my apartment (along with some shopping recommendations) and then keep scrolling for some styling ideas I found on Instagram. 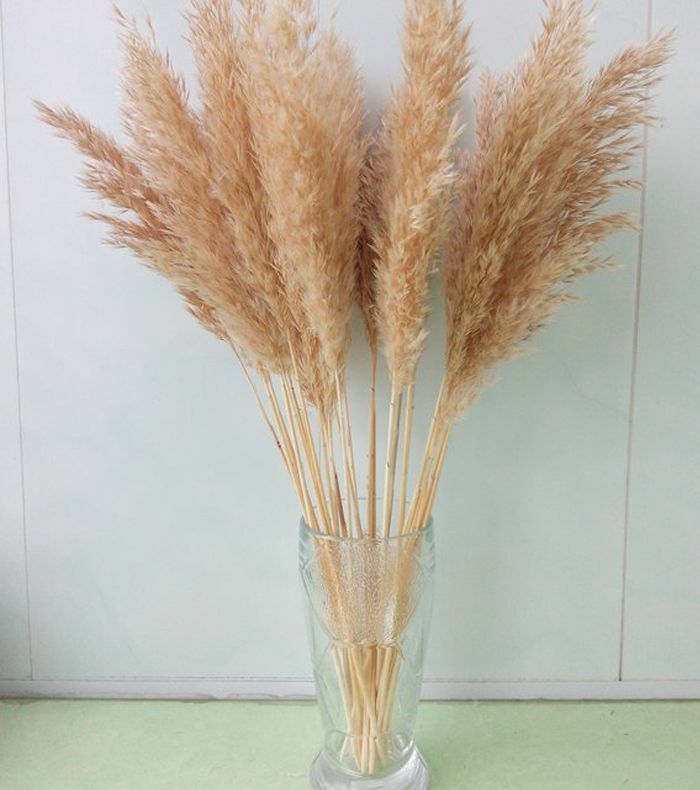 I added some pampas grass to a vase on my side table in the living room. It really brings texture and warmth into the space, which is especially important with the concrete flooring. This is a close-up of the pampas grass so you can see how fluffy it can be. If you add some hairspray, it should keep this fluffy texture, otherwise it will become quite dry, which is also a chic look too; it just depends what style you're looking for. 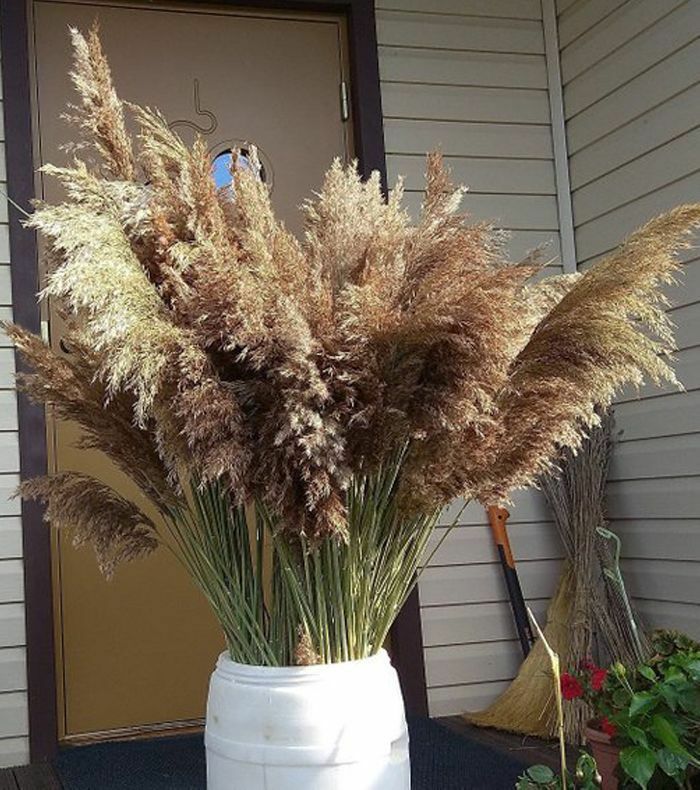 This is the new taller and fluffier pampas grass I brought home from the Nate Berkus and Jeremiah event. It is such a dramatic feature and really helps to bring this corner to life. I love seeing the light touch it when the sun comes out each morning. Pampas grass was also used by the talented team at Hello Gem for the photo backdrop of our inaugural Womaneer Power Lunch. It was a highlight. And it was used again for the backdrop of the recent Pottery Barn event in Austin where I interviewed Paola Mathé. Mandy Moore also used the popular plant to decorate the aisle at her recent wedding. I think we can all agree that this is absolutely stunning.